How is this possible? My Final Four are all still alive. The ridiculous method I employed to fill out this bracket should have assured nothing less than incorrect picks and mutually assured enjoyment of upsets. No one should want this bracket to be right. No one should want a Final Four filled with FBS powers. Yet, here we are. This bracket somehow predicted Stanford and Baylor reaching the Sweet 16. Michigan State and Louisville are still alive. Wichita State is dead. The dream is dead. All hope is dead. But this bracket just won’t die. 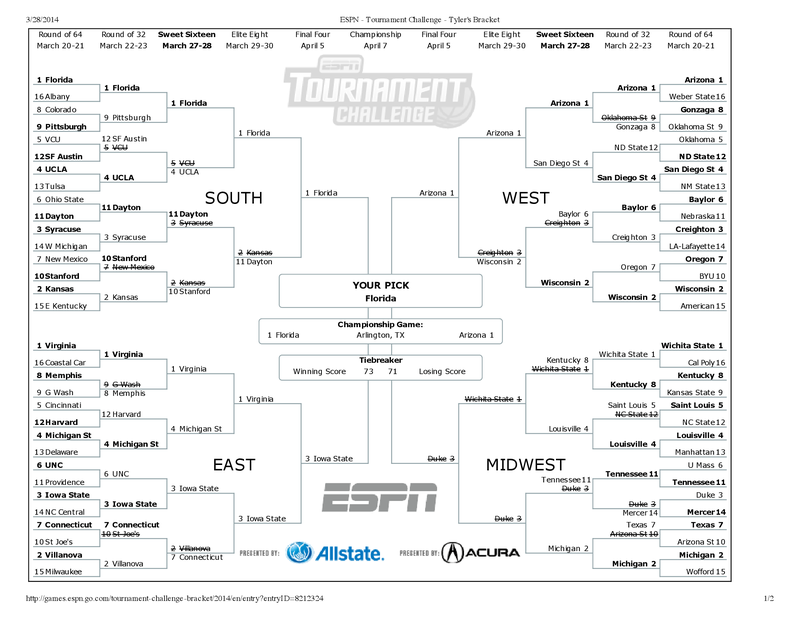 Going forward, please root against this bracket with me. I created a monster that I just can’t put to rest. I’m going to watch Mercer dance in peace. Editor’s Note: This bracket is doing pretty alright, all things considered. I am not heartbroken about my bracket. I have had better brackets, I have had worse brackets, and I will continue to have brackets of varying degrees of correctness for as long as I exist on this planet. The thing that bums me out is that I’m already out of the money for every pool that I am entered in. This struck me as extremely frustrating – I still have 3 of my Final Four alive, THIS BRACKET AIN’T BUSTED YET. So why is my bracket out of contention? Because I picked Florida to win the whole thing. I am in a pool with 100 brackets in it, and about 30 of them have Florida winning it all. I drowned before the boat left port. So a word of advice to any bracketeers looking forward to next year: Pick who you believe will win, but BE AWARE of the rad advantage of being the only dude in your league to pick Iowa State to win the title. Because when you’re the only dude in your league to pick Iowa State to win the title, and they do win the title, you get all the moneys. Still got a pulse? Still harbor hate for Mercer or Kentucky? Or Iowa State or Wichita State? Or North Dakota State? Or every single one of the 64 teams that kept you from getting that Buffett dosh? Still consider a dissection of the apoplectic rage you won’t remember this time next year for a WordPress blog even your friends won’t be able to find on Facebook’s Top Stories because you always go to publish in the middle of the night? Still check the scores to see how much worse it gets? Of course you do. That’s the kind of person you are. No, no, no, no, no, no, and no, only an idiot freshman would offer that as therapy for anything. That’s the kind of person I am. Hate me yet? Perfect. Come, let’s watch some more basketball together. Let’s spoil each other’s dreams every year. Yeah, so…I don’t really know what happened back there, but I went to Holland for a week and returned to a world in which 11-seed Tennessee had defeated 14-seed Mercer to advance to the Sweet 16. And if you like 12-5 upsets, this was the year for you. My champion is gone, VCU having gone down to the Stephen F. Austin Lumberjacks (actually, my champion, Kansas, is also finished, freshmen stars be damned) . Kentucky went ahead and gave Wichita State the shock treatment, becoming a curious case for lauded underdog in the process. Kentucky as an underdog, even this year? Stanford over Kansas? For people who like to watch the world immolate itself, bracketology is one guaranteed way to make that happen. This year is the coldest, hottest proof. I could sit here and tell you that I have some sort of emotion over the state of my bracket. But I’m not in the business of wasting your time. This tournament has been fun, folks. 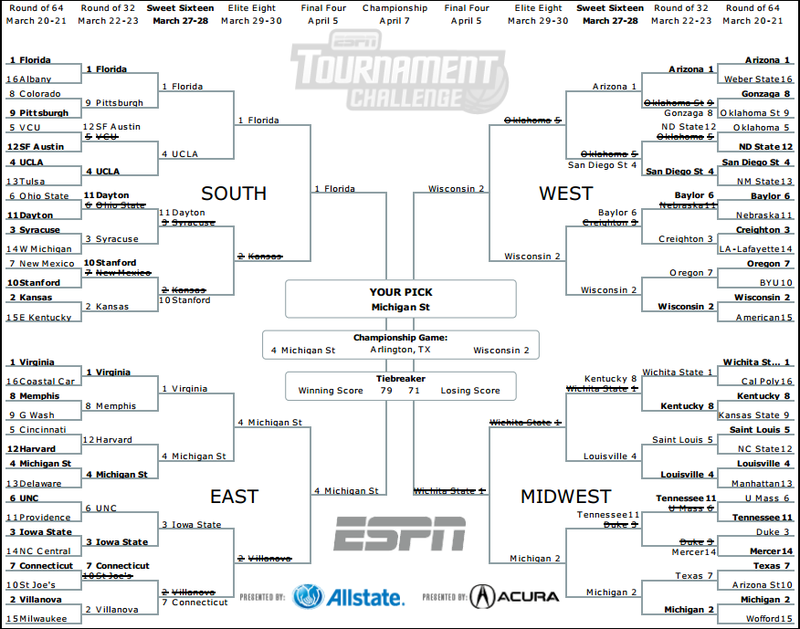 Yes, I had Wichita State winning it all. Yes, they lost to Kentucky. I also had Duke going far. Shoot, I had North Dakota State in the Sweet 16! Sooooooo, yeah, in hindsight…picking college basketball games doesn’t seem to be my strong suit. But, yanno what? There’s been a lot of basketball happening. Ohio State would find a way to miss if the basket was literally the Indian Ocean. Stephen F. Austin won 25+ straight games coming into the tournament. Duke and Creighton live and die by the jump shot—if those shots aren’t falling, those teams are in trouble. Kansas is without the Embiid dude. Wichita State couldn’t get the ball to the one guy who carried them the entire game (Cleanthony Early) in the final minute. If you just look at the scores, I guess you can say that there have been some surprises. But, with the right context, these games have played out the way that, um, basketball does. 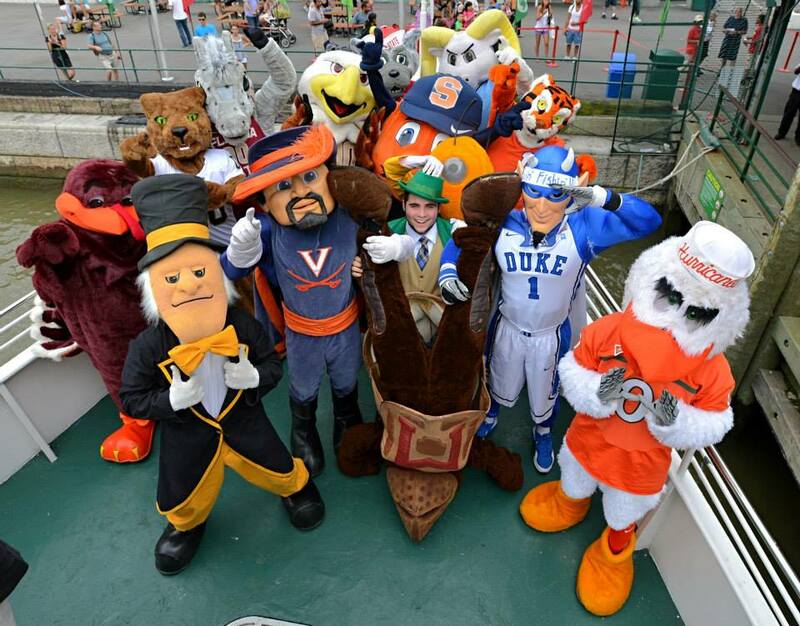 I will always have fond memories of this tournament (Those who know me will tell you that I can find a good memory in just about any sports event). March Madness makes you feel like you’re involved (“My bracket is screwed!” is probably your rallying cry, but it’s not like the remaining games won’t be played). It makes you dance around in your underwear after one too many Kraken and Cokes while watching Saint Louis erase a 16-point deficit (I can’t be the only person who did this). It makes you blame a kid who isn’t getting paid a dime for ruining your chance at a billion dollars. It makes you look for truTV on your channel guide. So, sure, my bracket is ruined. But whatever. I’ll be right back at it next year. 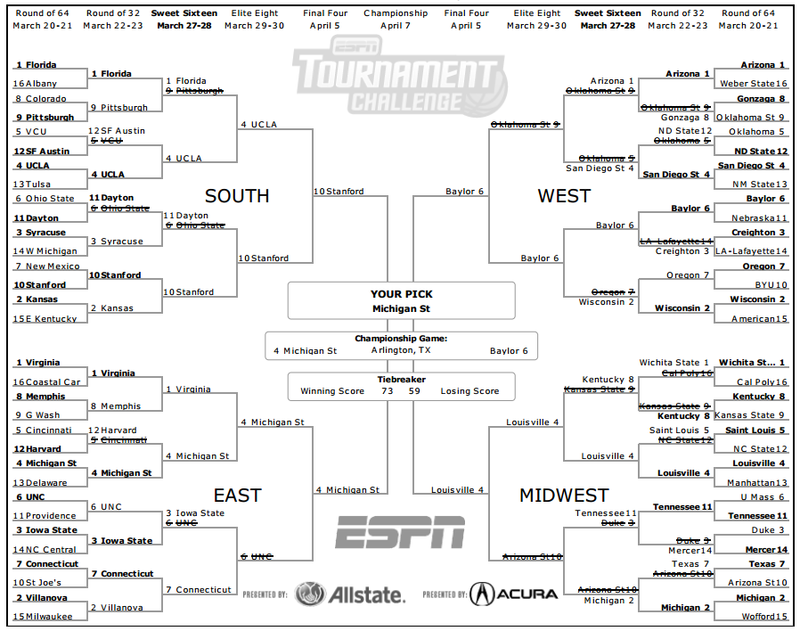 Actually, I’ll probably fill out an NCAA baseball tournament bracket. It’s a cycle of masochism that hurts so good. Jill Pellegrini: What is basketball. James Vasiliou: If there’s anything I have learned in my time as a follower of sports, it is to lean with your head and not with your heart. I told you that I knew two tidbits about college basketball this season with an aside that predicted the first upset of the Big Dance. It was less of a prediction as much as it was an absolute known fact that it happened. Was it because I stole a Sports Almanac from the near future and traveled in my DeLorean to construct the perfect bracket? No, because Duke and Syracuse both crumbled with extraordinary dance moves by members of the lesser-ranked competition being the punctuation mark to all of it. I knew that Ohio State was going to lose because of course they were. If you picked Ohio State over Dayton, you just assumed that their high ranking meant something or you are one of the thousands of Ohio State fans who put their blind faith into this institution’s sports teams. When the Buckeyes fell, people around the globe danced in the tears of the fan base with great zeal. People do this because Buckeye Nation is an entity that likes to flaunt its strengths while the performances of the people doing the heavy lifting always come up short. Buckeye Nation is essentially the Sochi Olympics of 2014. You are fools, all of you – you will never win.